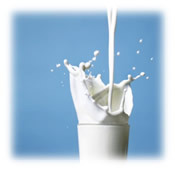 A lactose Intolerance diet involves eliminating Lactose, which is the natural sugar found in milk. This milk sugar is found in every kind of milk, whether from goats, cows, or from humans. As babies we have an enzyme called lactase, that will digest the lactose. However many people produce less and less of the enzyme as they grow into adulthood. The Lactose can no longer be properly digested, and remains in the intestine – encouraging the growth of bacterial colonies. Symptoms include anything from stomach-ache, severe cramps, diarrhea, and flatulence. Severity of Lactose intolerance differs from person to person. For some, milk and dairy products must be eliminated completely, – for others they need only be restricted. There are some that experience symptoms from eating breads or breakfast cereals (which may contain a small amount of lactose). In this situation ingredient labels must be read very carefully – even foods like chocolate, and cordials can contain lactose as a sweetener). One of the biggest issues with a reduced lactose, or lactose-free diet is maintaining adequate calcium levels. Fortunately dairy is not the only major source of available calcium. On completely lactose free diet, calcium supplements may be required. Many people also consume soy bean products – such as soy milk, and soy cheese. Lactase enzyme is available in tablet and liquid form, and when added to milk, allows the lactose to break down. Most foods can be enjoyed on a lactose intolerance diet; red meat, poultry, fish, eggs, mushrooms, fruit, vegetables, grains (rice, pasta, etc). All processed foods (baked goods, cookies, desserts, etc) must be carefully checked. There are also a wide variety of cow’s milk alternatives flooding the market place, so find one that suits your tastes and nutrition goals. I have been reading into this whole lactose intolerance thing and hearing/reading of different people’s opinions. I have concluded that as according to Mikhail (or ‘Michal’ in polish) Tombak-a known biochemist who has written several books about healthy lifestyle- it can be summarised that not only have I noticed I am ‘lactose intolerant’, then actually we are all ‘lactose intolerant’ from the very moment we pass the baby stage of life. Because, as it says and confirms at the very beginning of this page, only babies can digest lactose as babies produce the lactase enzyme naturally thanks to the mother’s breast milk which supplies it. So once we pass the baby stage it is unnatural to consume anything of lactose as it is indigestible for anyone. The only difference is the sensitivity of your organism whether it will react to the problem of indigestive lactose (so called lactose intolerance) or will the lactose be slowly killing your digestive system (not as sensitive organism) with the digestive problems noticeable/ painful in one way or another sooner or later in life (so called lactose tolerance). It is a shame that this fact is not well known and isn’t being spread enough to notice how we are ‘feeding’ ourselves health problems. another thing is eating ice cream is worse for me then having a glass of milk. which i cant even have. i dont get much calcuim at all because i am a very picky eater, which is not good because i already cant have a lot of things as it is. any ideas of how to get calcuim without any lactose what so ever. I couldnt have anything since i was little. i was diagnosed with it really young and it bugs me when i read about it and a lot of places say you cant be lactose intolerant that young. I havent been able to have any sort of lactose what so ever. and sometimes my cramps last for a few days. i would say over the years my pains get a lot worse. and i could probably cry thats how bad my cramps are. i get really bad diarrah. not only that but my cramps come instant depending on what i have. I read on the box of couscous which I love dearly that it contains MILK??????????? My whole family are lactose intolerant, but I thought I’d gotten away with it because it didn’t hit until I was 15 and I was horrified as I was a huge chocolate eater when it did. But then I realised that it didn’t affect my life as much as I thought it would. I just ask for no cheese or cream with my meals when I’m out and it’s never like there isn’t an alternative on the menu! I find that my diet is a lot healthier now that I can’t have ice-cream, cheese cakes or many of the puddings I used to adore. I can’t however say I’m a saint when sticking to the diet, I sometimes slip up and get the worst pain imaginable again when I do. I suppose I imagine it as my body giving me a big slap on the wrist and I don’t do it again for a long while. I’m still only 18 now, but I don’t find myself not enjoying myself when it comes to food. I DO notice that if I stay off lactose completely that my body reacts worse when I introduce a small amount to it again, so I make sure I’m not too stern with myself or I’ll find myself in a lot of pain even when having the smallest bit of dairy products, so I’d advise you to do the same even if it makes you a bit bloated at first. I am lactose intolerant but like to know moer about the lactose content of cheese : I had problems with Gorgonzola and creamy cheeses like camenbert. I would like to know how much is in there. Goat and sheep cheeses seem to give less problems. How much lactose is in there?? Is it the same lactose?? in the family. But is it true that your lactose intolerance will increase if you stop eating lactose full stop? I usually get diarreah when I would drink or eat diary products. I was in my mid 20’s, when I noticed it. I avoided so much milk intake and it seemed to be tolerable. Now I am in my mid 40’s and diarrhea 4 and 5 times per day. I went out for a bite to eat with a friend. We meet about once per month. I order biscuits and gravy and have to go to the restroom soon after. Abdominal pain, diarrhea, gas, bloated.. After starting my lactose intolerance diet, well no more diarrhea, no more gas or adominal pain, felt I could eat food. The soy milk is good. Has a almond flavor. The milk I drink is soy milk. I like it.. But this occured to me, with any milk products. Be a milkshake, bowl of cereal, cheese, ect.. Slim Fast at one time offered lactose intolerant ready to drink, what happened to it?